Comfortable seating for both front and rear passengers and a luxurious tech filled interior give this X5 its edge over the competition. 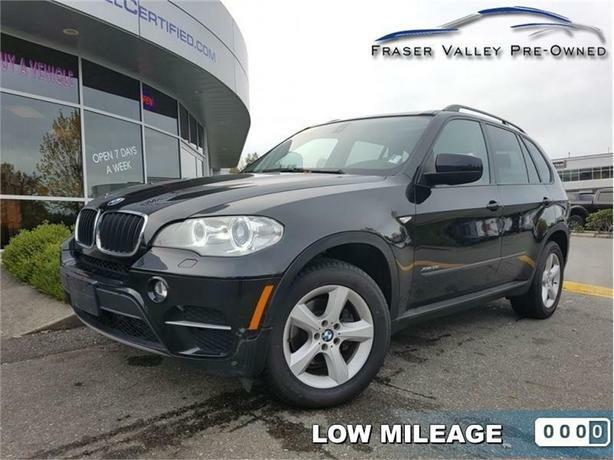 This 2012 BMW X5 is for sale today in Abbotsford. This 2012 BMW X5 continues to be a benchmark for any company contemplating a new luxury mid-size SUV. This X5's off-road-ability may be outweighed by its superb on-road manners, but that's all on purpose - it's a luxury family wagon tailored for comfort, meant for gated-community garages everywhere. Thanks to its well-rounded nature, this 2012 BMW X5 is a top choice for a luxury crossover SUV, especially if performance is a priority. This low mileage SUV has just 67170 kms. It's black in colour. It has a 8 speed auto transmission and is powered by a 300HP 3.0L Straight 6 Cylinder Engine. Buy this vehicle now for the lowest bi-weekly payment of $211.21 with $0 down for 72 months @ 5.69% APR O.A.C. ( Plus applicable taxes - Plus applicable fees ). See dealer for details.